Creamy tomato soup every day! We make our soup from scratch daily! Ask your server for today's selection. A bowl of today's soup with a garden fresh salad. Our hearty family recipe is the best in Montana. Chili fans, this one’s for you. Served with house-cut French fries, tater tots, potato salad or coleslaw. The classic bacon, lettuce, tomato & mayonnaise on thick sliced white bread. This simple classic has been taken up a notch with parmesan cheese making the exterior crispy & cheddar, provolone & swiss giving you the gooey inside. Dip it in our house made tomato soup and it is sure to excite your taste buds and leave you satisfied! Dry salami, pepperoni, prosciutto, provolone, onions, tomatoes, shredded lettuce & creamy italian vinaigrette on a telera roll. Can be served hot or cold! 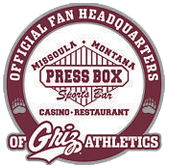 You can only find our signature burger here at the Press Box! It's a half-pound patty with pickles, shredded american cheese, hickory sauce & mayo on a toasted bun. We recommend no substitutions! Diced crispy chicken with tomatoes, lettuce, avocado & cheddar cheese tossed in ranch dressing. The first sauce is included, additional sauces $0.50 each. Hand battered, homemade, wild Alaskan cod. Crispy chicken fingers served with French fries & your choice of house-made dipping sauces. The Press Box’s Friday night special is our slow roasted, hand cut Prime Rib. Served with au jus, horseradish and all the trimmings, while supplies last.